Antonia Dora Plesko comes to Los Angeles to start Rhythm Village projects. Tropical Days of the Week. Our Latest Video, Tropical Days of the Week………( each day has it’s own fruit – and reason to be excited about that!). Enjoy and we’d love your comments!! New Rhythm Village CD just released, Order Now! Rhythm Village and Antonia featured on European TV, “IN Magazine” show. Mr. K, Kent Stevenson discusses Rhythm Village, music education. At long last, Antonia has come to Los Angeles to start working with Rhythm Village producers Joseph Zamberlin and Kent Stevenson, Along the way, we were treated to three Antonia concerts, one at Alvas Showroom, another at the Croatian Cultural Center and a third at Mary Star of the Sea Catholic Church, all in San Pedro, CA. Thanks to all involved in organizing these events, especially RV partner and photographer “El Imagenero,” Matt Lincir, owner of Alvas Music and Alvas Showroom. Also Frane Jerkovic and Maya Bristow of the CCC. 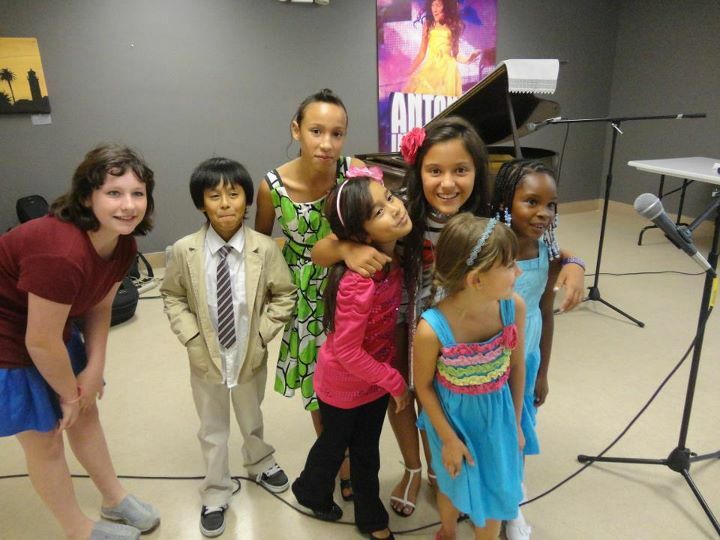 We were amazed by Antonia’s range of styles and her instant connection with the children Rhythm Village Music Camp Choir. Ten days later, Antonia left with seven jazz songs recorded with Grammy winner Kevin O’Neal and three pop songs, with five time Grammy winner Kenny O’Brien as well as trips to the beach and Hollywood, photo session with El Imagenero and the aforementioned concerts. Quite a whirlwind ten days. We are still catching our breath. Oh my. Rehearsal for Rhythm Village Live!! Jeff ‘Bongo’ Busch, Artis the Spoonman and the Circus Kids of Dearborn warm up and rehearse for the new show, Rhythm Village Live! See it when you get the chance, and just try to keep from smiling! 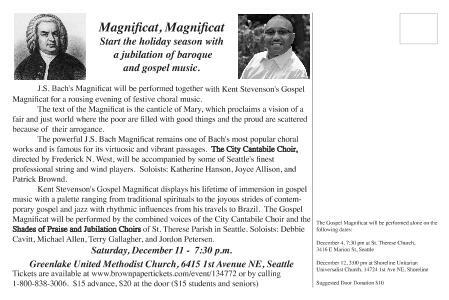 Mr. K, a purveyor of frivolity and seasonal mirth all year round, but most ardently at Christmas, found time to compose a Gospel Magnificat, programmed against the famous Magnificat by Bach, much to the delight of the Seattle audiences this past December. The piece, in its third staging, was enthusiastically received, many in the audience insisting that the work become a Seattle Advent tradition. We wholeheartedly agree. Mr. K Makes Waves, Again! Being a sketcher, I’m used to two-dimensional art, so when I heard about Saturday’s Freedom Festival organized by Arts In Motion, my head started spinning with interest. It’s all about combining the arts, explained Denise Mimura, a French horn teacher and founder of the arts school serving more than 600 children in the Rainier Valley neighborhood. “Music is the main component but there will be spoken work, dance and visual arts symbols of freedom,” Mimura said. The festival will feature a performance by Kent Stevenson’s choir of elementary school students. 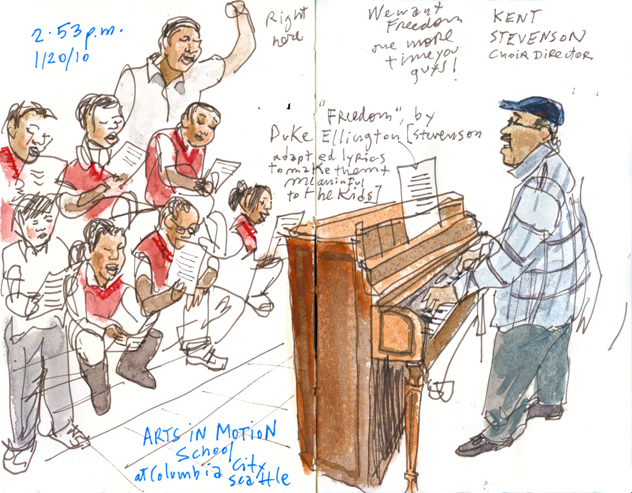 They were rehearsing a version of Duke Ellington’s “Freedom,” when I visited the school this week. “Since the Freedom Fest is a celebration of Martin Luther King and the spirit of peace and liberation, I felt this piece was ideal for the choir since it has a little swing,” he said. After the rehearsal I complimented the kids for their performance and they were excited to see my sketch. A 10-year old girl said I did a good job drawing Stevenson’s shoes. She said she likes music because “it’s like a hobby.” Jaydon Beleford, 8, said music is his favorite thing to do in the whole world. “It helps me with my rhythm and all the stomping,” he said with a big grin. The show is at Rainier Valley Cultural Arts Center, 3515 S. Alaska St., Saturday, January 23, at 7 p.m.